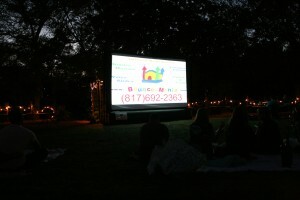 Fort Worth, make our movie screen the hit of your next event! The drive-in movie is making a comeback! With one of our inflatable backyard outdoor movie screens you can have the drive-in movie experience anywhere you choose and you also get to choose the movie, the snacks, the drinks and the movie time. We have three sizes from which you can choose. Corporate, City, school and church events are our specialty! We know exactly what it takes to make your event go smoothly. We have been trusted by many local cities, school districts, corporations and churches and we even have set up one of our screens locally for a movie premiere! 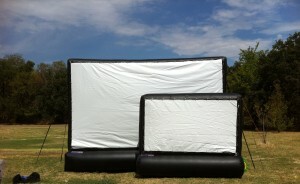 The first size is an 8 foot by 4.5 foot inflatable outdoor movie screen. This screen will be large enough for showings to about 35 people. The 8×4.5 screen comes with the following, a sound system, a DVD player, a projector and the movie screen. This inflatable backyard outdoor movie screen is 110″ diagonal viewing area. In comparison some of the largest home television sets are only in the 50 to 60 inch diagonal range. The second size is a 16 foot by 9 foot inflatable backyard outdoor movie screen. This screen will be large enough to accomodate 200 people. The 16×9 screen comes with a DVD /Bluray player, a projector and the screen. The 16×9 inflatable backyard outdoor movie screen comes with a 1600 watt PA system and this screen is a whopping 220″ diagonal. Keep in mind that the inflatable backyard outdoor movie screens may also be used indoors if you have a large enough area and high enough ceilings. We also do more than just backyard parties! We can do business, church, school events and the smaller size is PERFECT for weddings! The projector comes with a usb port from which you can project your .JPG pictures. The Bride and Groom larger than life on the big screen..
We serve not only Fort Worth but the following areas as well: Arlington, Burleson, Cleburne, Joshua, Crowley, Alvarado, Everman and Benbrook, Texas just to name a few. We will travel further with the 16×9 and the 20×12. Please call us to verify we are available for your date and if we can accommodate travel on that day as well as what travel fees you will incur. Ordering is simple and in most cases can be done online 24 hours a day and 365 days a year! To order or for more information please click the following link, but please note that you will be taken to our bounce house rentals Bounce-Mania website to complete the order process. You can also reach us by phone at (817)484-6760 (TEXT messages or voice calls) or email at sales@bounce-mania.com if you need further assistance. If you happen to call after normal business hours and need immediate assistance please text us and we will get back to you as soon as possible.